The North Dakota Game and Fish Department’s annual midwinter waterfowl survey in early January indicated 145,200 birds were in the state. While coyotes flourish amidst civilization, more sightings are being reported in the Minot area. Wildlife officials, however, are quick to point out that the situation isn’t critical. Hunter success during last fall’s limited pronghorn hunting season was 89 percent, according to statistics provided by the North Dakota Game and Fish Department. Available April 1st, 2015... April Spring Special Fishing Edition Book! Call 1-800-767-5082 or (701) 255-3031 and have your subscription to The Hunting and Fishing Magazine of the Dakotas delivered! Call today! The North Dakota Game and Fish Department tracked 23 outdoors-related bills during the 2015 legislative session, 12 of which were passed by both chambers and signed into law. The North Dakota Game and Fish Department will continue to implement camping restrictions on some wildlife management areas in western North Dakota and along Lake Sakakawea. With increasing amounts of littering on the state’s highways and particularly the Missouri River, North Dakota officials are making an effort to broaden the public’s perception of littering problems. *Indian Hills Resort: Anglers are enjoying an improving walleye bite. Try working the south shore in 9 to 15 feet. *Garrison: Finally, the east end of Lake Sakakawea is improving for walleye. Outdoor water recreationists are once again reminded to help prevent the introduction and spread of aquatic nuisance species in North Dakota. Family fishing days returned to the North Dakota Game and Fish Department’s Outdoor Wildlife Learning Site. The catch-and-release only fishery is stocked with trout, bluegill, largemouth bass and other species. North Dakota’s 2015 pronghorn hunting season is set, with 410 licenses available in three open units, according to Jeb Williams, wildlife chief for the State Game and Fish Department. Thanks for receiving our fishing reports. I hope you enjoy hearing the latest news from around our lake! In historic first, walleye fishing on Mille Lacs ended midseason as limits were surpassed. North Dakota’s 2015 waterfowl season is set, with noteworthy changes including a daily bag limit of two canvasbacks and three white-fronted geese. The daily limit is 15 and possession limit is 45. The North Dakota Game and Fish Department’s annual fall wetland survey indicates good but declining wetland conditions for duck hunting throughout much of the state. Even though some fall hunting seasons are winding down, poaching will continue. I field, hear and read many discussions on rules, regulations, poaching and “what if” scenarios. North Dakota Game and Fish Department district game warden Keenan Snyder is seeking information on several illegal-taking-of-wildlife incidents in recent weeks in the Williston and Watford City areas. The North Dakota Game and Fish Department’s fall mule deer survey indicated the population continues to recover in the badlands. Fisheries crews have completed their annual salmon spawning operation on the Missouri River System after collecting roughly 500,000 eggs. When it comes to presentation talk concerning bluegills, tungsten has dominated the discussions the past few years. Tungsten jigs have become popular because it’s much heavier than traditional lead. North Dakota anglers are encouraged to refer to the 2014-16 North Dakota Fishing Guide or the State Game and Fish Department’s website for winter fishing regulations. Mountain lion hunting during the late season in Zone 1 is closed immediately. The zone’s late-season quota of seven was filled after the final cat was taken today. Predators on the Prairie... Is there a problem? This winter, we’ve focused on what Dave Genz considers the keys to presenting a bait to fish under the ice. I have been doing this my entire life and this is probably one of the best deals I have ever come across. Great for Hunting, Fishing, Lake etc. Cabins. Low Maintenance. North Dakota’s spring light goose season opens Feb. 20 and continues through May 15. The 2016 spring wild turkey lottery has been held and hopeful hunters can check individual results by accessing the North Dakota Game and Fish Department website at gf.nd.gov. Potentially heavy fines were in the works last winter as a result of pipeline leaks in northwest North Dakota. “People no longer only think of the parks as just a Friday-Saturday camping trip during the summer,” said Doug Hofer, state parks/recreation director.”Now, park visitors take in events and activities year-round. Want to call yourself a turkey hunter? Learn to talk the talk. KILGORE, TEXAS – April 15, 2016 — Skeeter Products, Inc., the leader in performance fishing boats, announced its 20th anniversary as a Yamaha Boat Company this year. North Dakota’s 2016 deer season is set with 49,000 licenses available to hunters this fall, 5,725 more than last year. North Dakota Game and Fish Department fisheries personnel recently stocked more than 40 local fisheries with catchable trout, catfish and pike. The North Dakota Game and Fish Department reminds outdoor recreationists to keep public use areas, including state wildlife management areas, clean this summer by packing out all trash. North Dakotans who want to give fishing a try are reminded they can fish for free June 4-5. North Dakota game wardens will participate in a national boating under the influence awareness campaign called Operation Dry Water the weekend of June 24-26. I think as hunters, anglers and outdoors people, we have a deep understanding of how valuable access to public land really is. A non-profit group of over 200 members recently donated $50,000 to improving water quality and fish habitat in the Black Hills. The ring-necked pheasant means fun and memories for South Dakotans and its visitors, but it also means big money to main streets across the state. The South Dakota Game, Fish and Parks Commission recently adopted a ring-necked pheasant management plan for 2016-2020. The plan will guide pheasant management over the next five years. North Dakota’s 2016 pronghorn hunting season is set, with 730 licenses available in seven open units according to Jeb Williams, wildlife chief for the State Game and Fish Department. Thank you for all you do for ducks and duck hunters! Anglers who catch a tagged salmon are reminded to turn in the heads and report information to the North Dakota Game and Fish Department. Chinook salmon anglers in the Dakotas will soon begin exploring waters of lakes Sakakawea and Oahe in earnest, as the late summer season for the prized fish begins. COLUMBIA, S.C. (August 8, 2016) - It was a great weekend to be on the water fishing, especially for Berkley pro angler Jason Przekurat. If You Want to Catch Pike, Devils Lake is the Place! Racine, WI (August 25, 2016) – Offshore anglers are a meticulous bunch. They have to be. ​Legally licensed resident and nonresident youth waterfowl hunters age 15 and younger may hunt ducks, geese, coots and mergansers statewide. North Dakota’s two-day youth pheasant season is Oct. 1-2. Legally licensed residents and nonresidents ages 15 and younger may hunt roosters statewide. North Dakota’s pronghorn hunters are reminded the gun season opens Sept. 30 at noon Central Time, and continues through Oct. 16. The number of pheasants taken last year in North Dakota was similar to 2014, according to statistics compiled by the state Game and Fish Department. This is the magical time of year at Devils Lake, North Dakota. Waterfowl season is open. Walleye season is always open. Birds are flying and fish are biting. Drivers are reminded to watch for deer along roadways this time of year because juvenile animals are dispersing from their home ranges. The North Dakota Game and Fish Department’s fall mule deer survey indicates that mule deer had another good year of fawn production. Living in eastern South Dakota, we’re supposedly in a pheasant paradise. In actuality, pheasant hunting is extremely tough around here. There is precious little habitat left to hunt pheasants. The lake and town with the same name, Devils Lake, North Dakota, seem to have been made with one purpose in mind -- fishing. The 14th Annual Beulah Big Buck Contest is open to the public... free admission! Today’s modern era of ice fishing offers advancements in equipment that make anglers more efficient on the ice. Flashers, underwater cameras and GPS Mapping have helped us locate and catch a lot more fish. It’s been another amazing deer season. There’s been some solid memories made for sure. Migration updates available at 701-328-3697, until season ends or geese have left the state. North Dakota’s spring light goose season opens Feb. 18 and continues through May 14. The delicate life cycle of pheasants is strained this witner season, especially in North Dakota. On any given day, a boat could slip into the Missouri River below Garrison Dam, head down river, and catch a walleye or two. Years ago, I hardly knew anyone who went afield specifically in search of shed antlers. Over the past several years though, the pastime has gotten much more popular. Snow geese, snow geese and more snow geese! That’s what we witnessed on a mild spring day in northern South Dakota recently. Your hunting areas have changed and the turkeys have already adapted. Will you? Order now to increase your pheasant population by hunting season! New Flextone calls combine ergonomic, positive grip pot designs with proven Flextone sound technology. 908 students from 38 North Dakota high school teams are participating in the North Dakota State High School Clay Target League (NDSHSCTL) 2017 spring trap shooting season, which began April 2nd. Subscribe online or call (701) 255-3031 or 1-800-767-5082 with your Visa or MasterCard ready for fast service! Here's a light look into the May 2017 Edition of Dakota Country magazine. Devils Lake, ND - From the mid-1970’s to today, the Devils Lake, North Dakota community knows how to throw a party. They call it the Chamber Walleye tournament, now in its 41st season. North Dakota’s 2017 pronghorn hunting season is set, with 410 licenses available in five open units. North Dakota Game and Fish Department fisheries personnel are wrapping up a record year for stocking of walleye fingerlings in more than 130 waters across the state. With my recent renewal subscription to TIME magazine I was given a free subscription to MONEY magazine. Talk about a contradiction of life styles. This is no fish tale: There is a 17-pound walleye swimming in North Dakota’s Lake Sakakawea. 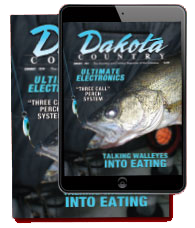 Subscribe to The Hunting & Fishing Magazine of the Dakotas and have the September Special Edition delivered... call 1-800-767-5082 or (701) 255-3031 and start today! North Dakota’s roadside pheasant survey conducted in late July and August indicates total birds and number of broods are down statewide from 2016. 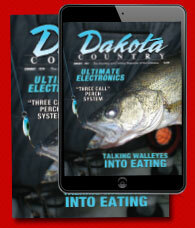 Subscribe to The Hunting & Fishing Magazine of the Dakotas! Call (701) 255-3031 or 1-800-767-5082 and start your subscription today! The Little Missouri River Commission postponed taking action Wednesday on a policy involving oilfield use of the state scenic river. Each Christmas gift subscription (1 year/10 issues) only $20... Plus, we'll send your giftee a personalized and attractive Christmas card announcing their Christmas gift! Have The Hunting and Fishing Magazine of the Dakotas delivered... call 1-800-767-5082 or (701) 255-3031 or subscribe online! The North Dakota Game and Fish Department’s fall mule deer survey indicated fawn production in 2017 was lower than in 2016. Stop in today or visit us online at www.rivercityboats.com to view our entire inventory of Ice Castle Fish Houses! Here's a light peak into the January 2018 Edition... Call 1-800-767-5082 or (701) 255-3031 and start your subscription today! Friday February 16th, Saturady February 17th and Sunday February 18th, 2018! Rebates and Incentives Going on Now at RCS! Have The Hunting and Fishing Magazine of the Dakotas Delivered! Subscribe online or call our main office in Bismarck at (701) 255-3031 and start your subscription today! April Spring Special Fishing Edition! Here's a light look into our biggest book of the year... the April Spring Special Fishing Edition! Take Advantage of Huge Discounts on all the top name-brands in the industry at the 2018 Spring Grand Re-Opening of Capital RV Centers in Bismarck and Minot! Join us for (3) events during the 2018 open water fishing season! Over the last 10 years North Dakota has gradually added a number of rules and regulations designed to slow or prevent the spread of aquatic nuisance species. We all want the best for our kids. A good home. Good friends. Good school and sporting programs. The North Dakota Game and Fish Department is closing access to West Arroda Lake in Oliver County, effective immediately, due to dangerous ice conditions caused by rapidly receding water levels. Have The Hunting & Fishing Magazine of the Dakotas delivered! Call (701) 255-3031 and start your subscription today! Is the dam safe to drive over? Do I have to hop that fence to get to the lake? A fish kill affecting adult rainbow smelt is ongoing in portions of the upper half of Lake Sakakawea. The North Dakota Game and Fish Department reminds water recreationists along the Missouri River to be cautious of potential safety hazards due to high water levels. Here is a light look into the July August 2018 Edition of Dakota Country Magazine. To subscribe call our main office at (701) 255-3031 and start your subscription today! High water levels on the Missouri River have closed or restricted access at numerous public boat ramps, specifically in the Bismarck/Mandan and Williston areas. Subscribe to The Hunting & Fishing Magazine of the Dakota! Call (701) 255-3031 or 1-800-767-5082 or subscribe online! No meetings and 100% FREE! Want to know more about the latest gas line project that would run under Lake Sakakawea? Have The Hunting & Fishing Magazine of the Dakotas delivered! Call (701) 255-3031 or 1-800-767-5082 and start your subscription today! Biologists counted 2,446 mule deer in the aerial survey in October. Enjoy the finest lodging in the Garrison, North Dakota area near Lake Sakakawea! Many fishing and hunting opportunities available outside your front door! Little's Bar & Grill of Pick City, North Dakota hosted it's annual northern pike spearing tournament on February 16th, 2019 out of Pick City. Dakota Tackle Annual Storewide Sale! March 30th through April 13th! The Upper Midwest's Leader in Fishing Components! Custom made to your specifications! Exceptional Quality and Craftsmanship! Great Gift for Christmas, Birthday and Father’s Day! 12th Annual Big Muddy Walleye Classic at Marina Bay, Mandan. May 2nd, 2015. Largest Walleye Pot. Limited to 100 teams. 1st Place Guaranteed $12,000 (based on full tournament of 100 teams). The 27th Annual Kenmare GooseFest is set for October 17 through 24, 2015. Pre-Registration Required. Call (701) 873-4585 for details. 1st Place for whitetail and mule deer $750. Windsor Canadian is releasing 300 banded pheasants across North Dakota this fall. Shelters & Augers on Display with Large Selection of Bulk Ice Tackle & Jigs. - January 15th, 2016... 350 Gun Raffle Drawing! Displays & Demonstrations... Intereted Exhibitors Contact Lynn at (701) 252-1400. Limited booth space available. Official Elk Tag Raffle Event Ticket available in the February/March Edition of Dakota Country Magazine. The North Dakota Game and Fish Department’s Becoming an Outdoors-Woman program is announcing its schedule for 2016. A new paddleboarding event is set for July 7 at Harmon Lake in Morton County. 12:01 AM - Hunting & Fishing in appropriate categories may begin and will continue until check in. Full lunch and dinner menu! Displays and Demonstrations and more! The 22nd Annual Dakota Walleye Fishing Tournament held out of Beulah, ND. Registration is at 6:30-700 am CST. Bis Man Reel and Rec Club presents its 37th Annual Walleye Derby! Join us for the 10th Annual Jamestown Rural Fire Department and Knights of Columbus Ice Fishing Tournament! 18th Annual Spirit Lake Marina Walleye Classic on Devils Lake, North Dakota! Presented by: The Little Bar & Grill in Pick City, North Dakota! We'll see you at the Pick City State Park on Lake Sakakawea under the main shelter Friday night! Application deadline is March 31, 2019 to be included in the April 3rd drawing. Prizes & Raffles Galore with Great Food and Friends! DEVILS LAKE, N.D. – February 21, 2019 - Anglers are already making plans for the 43rd Annual Devils Lake Walleye Tournament.